For Christmas eve I promised to bring some baguette. And as I felt adventurous I decided to try the Emmer Baguette I was thinking about since I baked the emmer ciabatta last autumn. 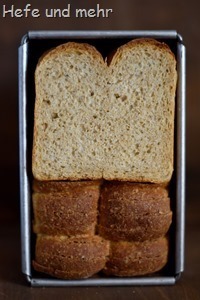 The white emmer flour which I used lays somewhere between Type 812 and 1050. So it has still a good portion of bran. 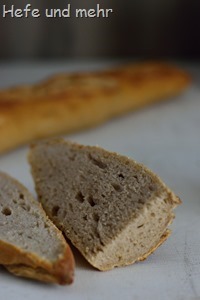 To enhance the gluten network I opted for enzyme active bean flour – just like I did for the spelt einkorn baguette. And it worked surprisingly well, leaving me with a dough which was easily shaped to a baguette. It hold it shape very well during proofing and had a gorgeous oven spring. The crumb was not as open as I wished for – I guess it is due to the weaker gluten network of emmer compared to wheat or spelt. 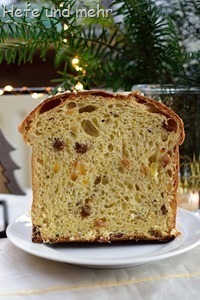 But the flavour makes us forget about this very fast, as it is at the same time creamy and nutty. 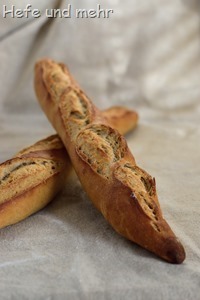 So they are a delicious addition to the baguette family on the blog. Mix emmer flour with water and let it rest for 60 min (autolysis). Now add the remaining ingredients and knead 5 min at slow. Let it rest for 20 min, then fold it from the outside of bowl into the middle for three or four times. Let rest for 20 min again, then fold the dough again. Repeat another two times. Ferment the dough for 24 hours in the fridge. Heat baking stone in the oven to 250°C. In the meantime divide into three equal pieces andand roll each piece into a log. Let it rest for 20 min. Now flatten the preshape baguette. Fold the dough from the long side into the middle and press it gently together, then fold it over again. 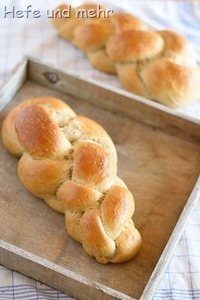 Roll it gently into baguettes of 30 cm and proof them seamside up in the folds of a bakers linen (=couche) for 45min. 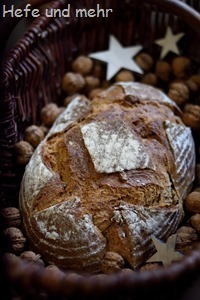 Slash flour times and bake the loaves on the hot stone for 25 – 30 min at 250°C with steam, until the crust is golden brown. ich habe die letzten Wochen einige Versuche mit den Urgetreiden gemacht. Mit etwas Apfelmus im Teig bekommt man etwas mehr ” Fluffigkeit ” rein und die Backwaren bleiben saftiger. @Anke: Fehlende Fluffigkeit ist nicht das Problem, sondern die fehlenden großen Poren in der Krume(= fehlende Ofenporigkeit). 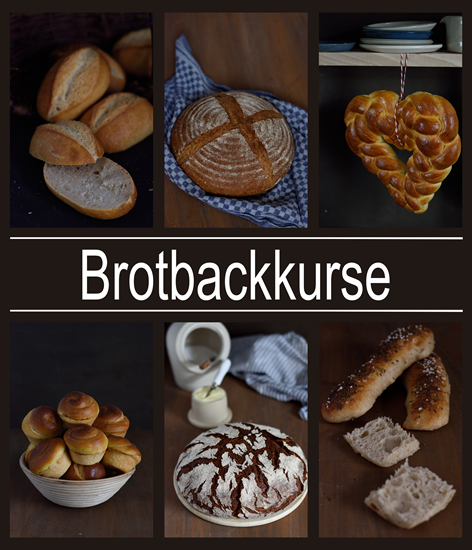 Die Krume ist fluffig, aber feinporig wie ein Brötchen. Bei den Emmer-Ciabatta habe ich eine etwas offenporigere Krume bekommen, da habe ich aber auch mit deutlich mehr Wasser und etwas Flohsamenschale gearbeitet, was für ein Baguette aber nicht in Frage kam. 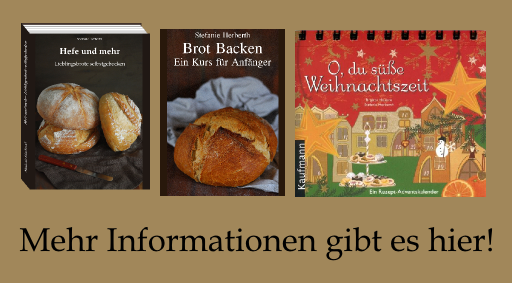 Eine Beimischung von Dinkelmehl würde das ändern (wie beim Dinkel-Einkorn-Baguette), dann wäre das Glutennetzwerk stärker.